This year, the American Cancer Society estimated that about 30,000 individuals were diagnosed with multiple myeloma, the second most common type of blood cancer. When Kathy Elsey was given this very diagnosis, she and her husband, Dr. Bruce Elsey, knew that they were in a unique and empowering position. By combining corporate success with a philanthropic cause, they have created a widespread campaign that reaches far beyond the pet community to raise money and spread awareness in the fight against cancer. As the co-founders of Dr. Elsey’s Products, Dr. Elsey and Kathy started the Cats Against Cancer Campaign in order to aid the Multiple Myeloma Research Foundation (MMRF) and support advancements in cancer research. The result of this partnership is a collaborative business model in honor of patients around the world. “We want to see a cure and we want to see it yesterday,” says Dr. Elsey. We are currently in the third month of the campaign, which spans multiple social media outlets including Facebook, Twitter, and Instagram. We wanted to make the campaign even more impactful this year, so we’re harnessing the healing power of cats! Interacting with animals has been proven to increase oxytocin (calming endorphins) levels, which has an impressive effect on the body’s readiness to heal and produce new cells. Simply petting your cat can produce an automatic relaxation response, which is believed to reduce the amount of medication needed in some cases. On our Share Your Story page, we’ve compiled your personal anecdotes, photos, and experiences with cat therapy – truly bringing together our fierce, feline community to support those who are suffering. 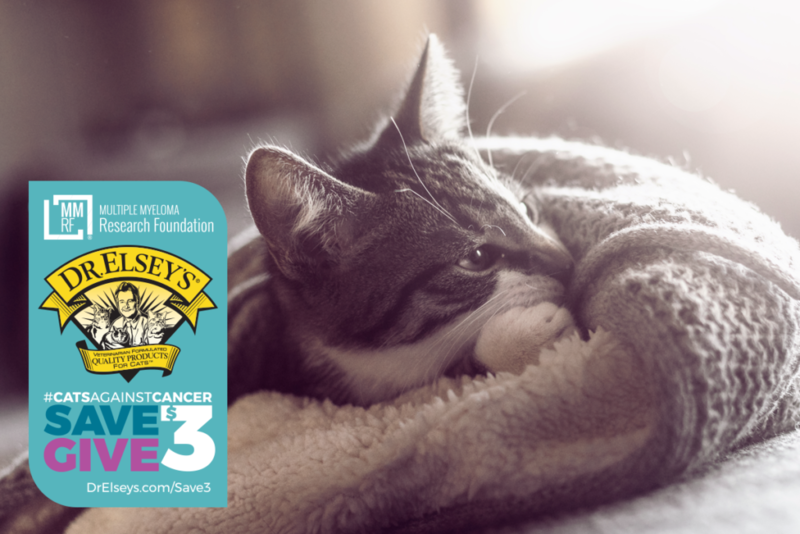 Like previous years, we’ve created a downloadable coupon on the campaign landing page that saves you $3 on your next purchase of a 40 lb bag of Dr. Elsey’s Ultra Litter, and for every $3 saved, Dr. Elsey’s donates $3 to the MMRF. If you’ve missed the news, don’t worry, this campaign will run until February 2018. Since 2009, the Elsey family and Dr. Elsey’s Products have contributed over $10 million to the MMRF. You can make a difference! Join the Cats Against Cancer movement and help find a cure by visiting https://drelseys.com/save3/. After you have downloaded your coupon, share a photo or story on our Share Your Story page: https://www.drelseys.com/share-your-story/.